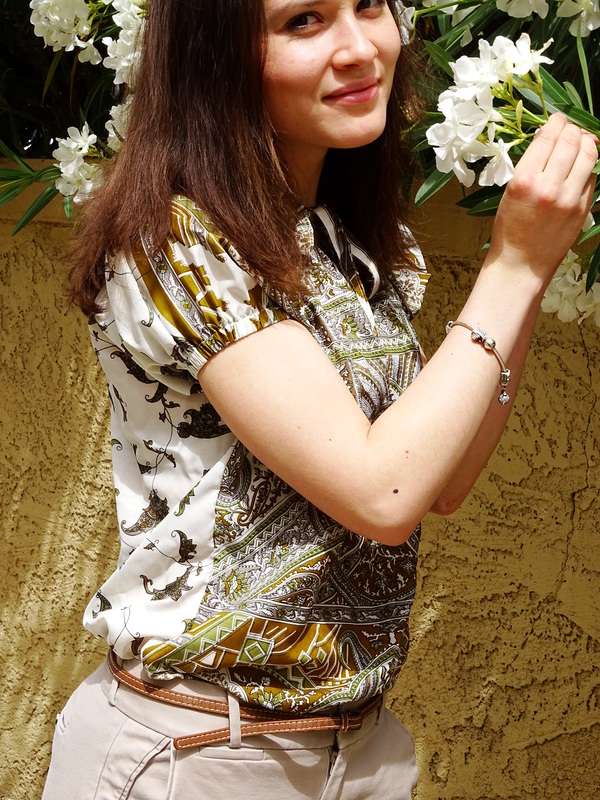 Me Made May #4 – Go ask Alisa – DIY capsule wardrobe one stitch at a time! 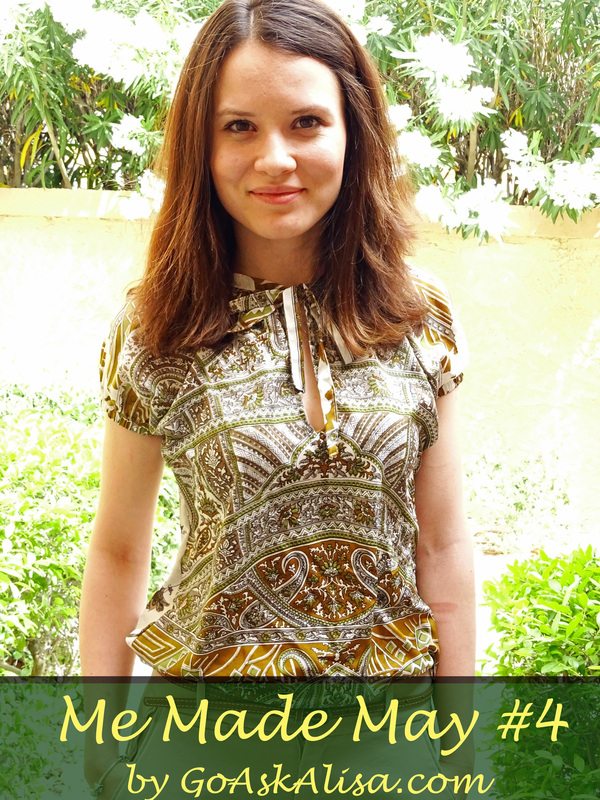 Continuing Me Made May with HUGE delay – this outfit #4 features ruched peasant blouse from Burda 09/2014. It is as well – quite recent addition to my wardrobe and I love the look that it gives: easy, comfy, yet still put together. For work I usually layer it with tan jacket on top, and if I have something to do on the casual side after work – I can throw a light cardigan on, or if the weather is good enough – go just like that! Pattern: Burda style ruched blouse. Pretty straight forward easy pattern that consists only of 1 pattern piece. The most difficult part is the front split – you have to spend some time to master it, and be sure to google it before you do it, it will make things easier. Besides that you are better off using elastic band instead of just ruching, since you have to make sure that you can get in those sleeves. I did not use elastic for the neckline, and gathered it by attaching binding that is also used as ties. Fabric: use only lightweight fabrics. I used 100% natural silk, that has VERY vintag-y look, and since it was a border print fabric I decided t use it in a very interesting manner: front is done out of border print, and back is done out of pattern that runs through the whole fabric length. It is lightweight, which allowed to gather it beautifully, but the fabric is not sheer – which is a huge plus for me. Additions: the front split that I made is a tiny bit tooo deep, therefore next time I will be more careful with that. For those who like quick makes – this is a perfect project, if you are a fast sewer it will take you somewhere around 2 h. Sounds good, doesn’t? Also, although I did trace the pattern out from Burda, if you are experienced enough sewer and have some knowledge in pattern drafting – you can definitely draft this pattern by yourself. I love this blouse!!!!! So pretty!! !